44% of property managers list marketing to new tenants as a top priority. This year, attract and retain tenants with must-have office space upgrades and amenities. 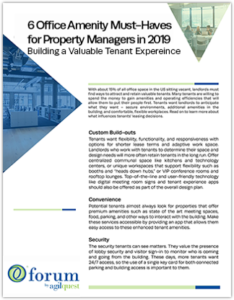 Download our guide to access the top 6 amenities property managers and building owners should offer tenants to stand out from the building next door! See how AgilQuest can help your people love where they work!